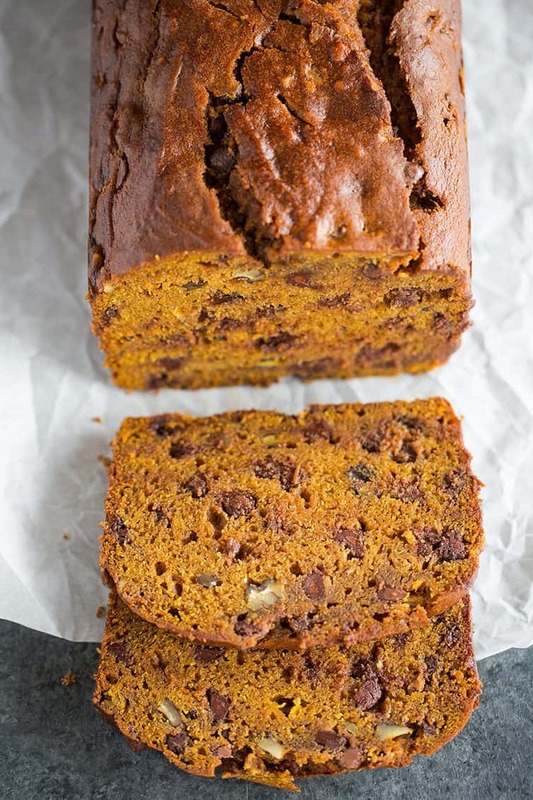 This easy, one-bowl pumpkin bread is crazy moist, loaded with spices, chocolate chips, and pecans, and freezes beautifully. It is a perfect bread to put out for company, serve on Thanksgiving, or bake up in small loaf pans for holiday gifts. Last summer, when I asked readers to send me their favorite tried and true recipes, I received a TON of pumpkin recipes. I made a few before Dominic was born (including this pumpkin yummy dessert that was a big hit), but I shelved the rest until fall rolled around again. Well, here we are, fall again, and we have Shirline to thank for this absolutely fantastic pumpkin bread! When she emailed me the recipe, she said she begins making it in the fall and continues to churn out loaves all through Christmas. Her family refers to it as “Grama’s Pumpkin Bread”, and she makes loaves both for her family to enjoy and in smaller batches to give away as gifts. After making dozens of pumpkin breads myself, I have to agree with Shirline – this is the best of the best! You will be amazed at how much batter this recipe makes… you will want to use a large mixing bowl! I love how easy it is to prep this bread (and Joseph loved helping to mix!) 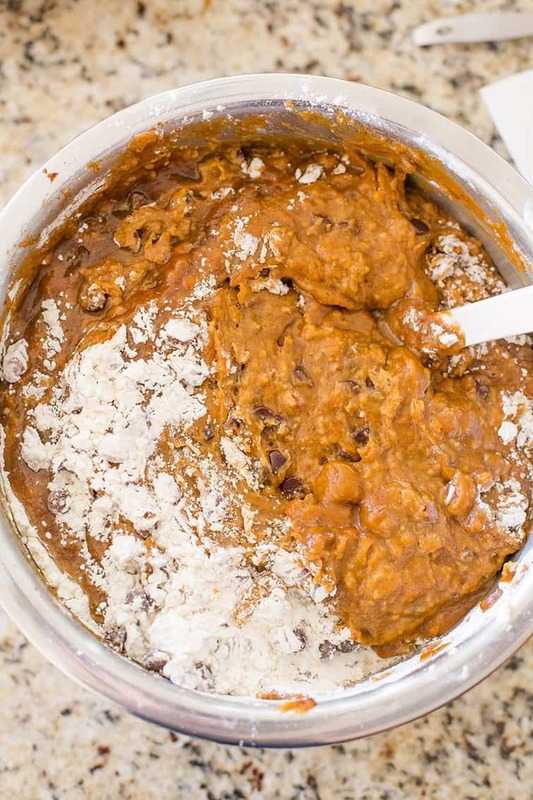 – canned pumpkin and tons of spices gets mixed together first, then vegetable oil to keep the bread nice and moist, eggs, sugar, flour, and the all-important add-ins: chocolate chips and pecans. While you COULD make the bread without them, Shirline exclaims that it just isn’t pumpkin bread without the chocolate chips and pecans! They add a wonderful punch of sweetness and crunch to the super moist, spiced bread, and it’s great balance. When I tell you that these loaves are as heavy as bricks, I kid you not. They are HEAVY… but also supremely moist and dense in the most wonderful way. They remind me of the Russian pound cake that my mom, aunt and grandma all used to make for the holidays. You can eat this warm or at room temperature, but like most pound cake or quick breads, wrapping it tightly in plastic wrap and letting it sit overnight makes it even better! As a result, this is perfect to keep around for a week or so, and goes wonderfully with breakfast coffee or an afternoon cup of tea, or for dessert any time of day. This has officially become my go-to pumpkin bread recipe – it’s easy, full of flavor, and super moist; you can’t ask for much more than that from a pumpkin bread! It freezes really well, so it would be great to bake up a few loaves (or even mini loaves) to keep in the freezer for last-minute guests or to get a head start on Thanksgiving baking or holiday gifts! 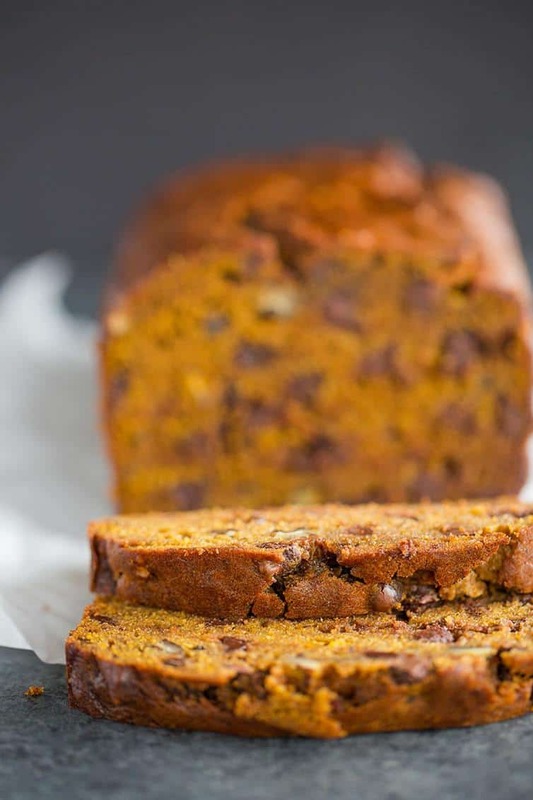 This easy, one-bowl pumpkin bread is crazy moist, loaded with spices, chocolate chips, and pecans, and freezes beautifully. Preheat oven to 350 degrees F. Grease and flour two 9x5-inch loaf pans. In a large bowl, whisk together the pumpkin, baking soda, cloves, cinnamon, nutmeg, ginger, and salt. Add the oil, eggs, and sugar and whisk until it is thoroughly combined and there are no streaks of egg or clumps of brown sugar. Add the flour, chocolate chips and pecans, and use a rubber spatula to gently fold and stir it together until completely combined. Divide the batter between the loaf pans and bake until a thin knife or skewer inserted into the center comes out with just moist crumbs attached, anywhere from 1 hour to 1 hour 15 minutes. Allow the loaves to cool for 15 minutes, then remove from the pans and place on a wire rack to cool completely. The loaves can be wrapped tightly in plastic wrap and stored at room temperature for up to 1 week, or frozen for up to 2 months (if you freeze them, add a layer of foil or place in a ziploc freezer bag). « Previous PostParty of Five, Here We Come! I made this recipe twice in the last three weeks. The first time I made it, I did it exactly as stated (except that I used homemade pumpkin puree instead of canned) and found that it was close to being done at 1 hour and 15 minutes, but not quite. However, the outside was starting to darken too much, so I took it out of the oven anyway. As it cooled, the center caved in because it was less done than I thought. After it was fully cooled, I scooped out the raw center; what I could salvage was EXCELLENT. It’s so moist and has a wonderful flavor. I baked it again a week later using three smaller pans (8×4 instead of 9×5) and it turned out perfect! Still needed to bake it for 1 hour and 15 minutes even with the smaller pans. Not sure if this has to do with the fact that I used homemade pumpkin puree or not. Either way, this is a keeper! My kids love it, and our Thanksgiving guests raved about it. Thanks for sharing it! So, I’ve been making these to give to various people, and everybody seemed to enjoy them, but one I didn’t give to somebody (for a reason I can’t remember) and my mother ate some. She LOVED it, but I wouldn’t let her finish it as it isn’t really very healthy for her. I stuck the other part in the freezer and I promised to make it for her, fresh, Thanksgiving morning…which I did (though I’ve been subbing walnuts after the first batch I made -who can believe the price of pecans, right?) and EVERYBODY thought it was wonderful. My nephew didn’t want to eat anything else! And we’re not really a pumpkin flavor family either. This was the first time I ever baked anything with pumpkin at all!In any case, I know you generally don’t make recommendations like this, but I was hoping to just maybe make it a teeny bit better for my mom, by subbing 1/2 whole wheat – which I would do by the cup, but I’ve been weighing the white flour, based on your recipe, and I’m worried that suddenly measuring by the cup will mess up the receipt. But I sort of presume whole wheat has a different weight, so I don’t know how to weigh the correct measurement of 1/2 white and 1/2 whole wheat…I was hoping you might be able to tell me. TIA and happy Thanksgiving! 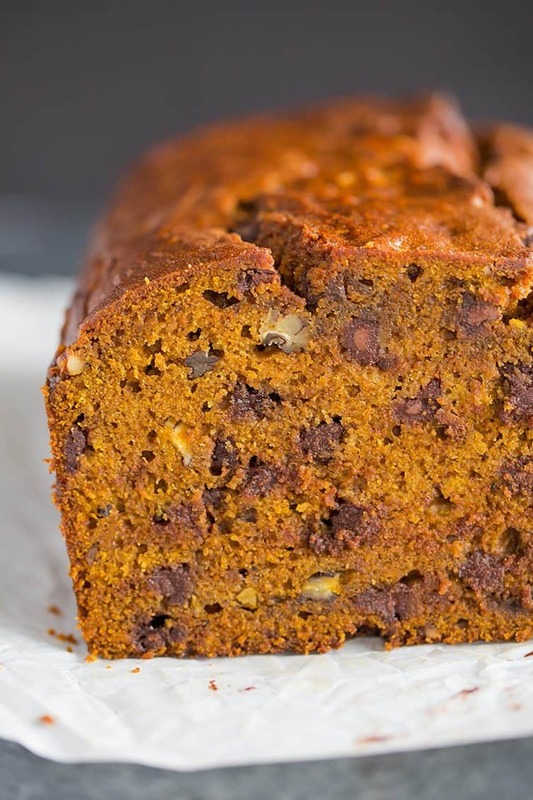 Hi Debby, I’m so thrilled to hear how much your family enjoyed this pumpkin bread! As for subbing 1/2 whole wheat flour, these are the measurements I would recommend: 319 grams all-purpose flour and 254 grams whole wheat flour. I’d love to know how it turns out! Very delicious and moist. I put some of the batter in a loaf pan and the rest in a 9×13. Worked out great. Had plenty in both. About how long to bake this recipe in 6 in mini loaf pans? Hi Billie, You’ll need to use some trial and error, as I haven’t baked at that size before. I would recommend starting to check around 30 minutes. Made this recipe over the weekend. Delicious flavor in this bread. It’s the perfect spice mix! I had some trouble getting my 9×5 loaf cooked through. Next time I’ll tent it. I used the other half of the recipe to make two small loafs and cupcakes. In my house, I’m the only one who eats pumpkin, so the cupcakes are perfect for me. I can pull one out of the freezer at a time. The loafs are for giving or putting on cookie trays. I help with hospitality at my church so I’m always looking for things to make that will help me fill out a tray and slices of this bread will go fast. I followed the recipe and used the chocolate chips, but next time I’ll do raisins instead just because they are more my thing. I had a tough time too…I will definitely tent next time. But it smells divine! I made only one loaf because I did not have a bowl to make two loaves.. Even in my one bowl it was a lot of ingredients. I made it for work and everyone loved it. 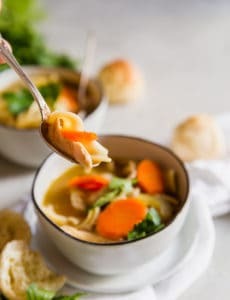 I also gave some left over to my friends and loved it and want the recipe. I will make it again but will get a bigger bowl for two loaves. When I took the bread out of the pan I used a paper towel on top of the bread because it was still worm. On the bottom of the bread it had very deep cracks. Also, it was very moist in the center. I cooked it about 55 mins. because it was getting dark around the edges, but when I stuck it with a tooth pick it came out clean. What would make the bread crack and is the center be very moist. Tasted very good. 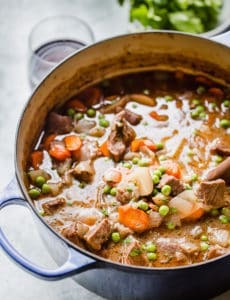 Love your recipes and blogs. 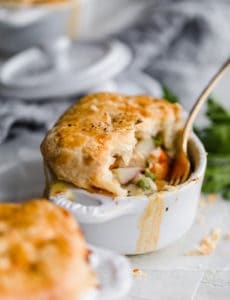 This looks amazing, can’t wait to make. I’m going to make these into mini loafs to give out to friends. Do you happen to know the baking time? Hi Toni, I do not, it would all depend on the size of the pan. You’ll need to use a little trial and error and start checking early. Toni, I made 6 mini-loaves with part of the batter and they were done in 30 minutes. My pans are about 3 by 5 and I put 3 level ice-cream scoops of batter in each one. You’re welcome Joanne, so glad you loved the bread! I made this pumpkin bread this afternoon and I should’ve figured out based on the measurements how much batter there was! It is heavy and fairly dense after baking (which took longer than 1 hour – closer to 1.5 hours) but it was baked all the way thru. And the chocolate chips and pecans didn’t sink! It did raise over the edge of the pan while baking which slightly worried me but there wasn’t any overflow after all: burnt oven = unhappy dad! It has yet to cool all the way but right now it has the Mom Seal of Approval and I’ll be definitely baking this one again! So glad you had a great experience with this bread! Hi Michelle….I want to make this today, but I noticed it says a 28 ounce can of pumpkin and all I find is 29 can….is it the full can of 29 or do I need to weigh out 28 oz? Hi Carolyn, I think using the 29-ounce can would be fine, it just may need to bake a smidge longer. No need for extra measuring. 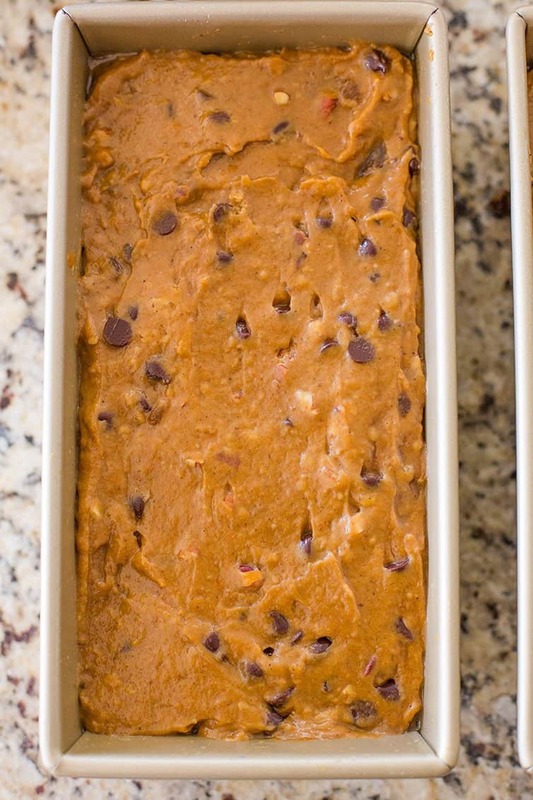 Pumpkin bread with chocolate chips in it, is very yummy! Nuts that are baked in it, is even better! Yummm! Hi Anat, I do have a recipe for homemade pumpkin puree (https://www.browneyedbaker.com/homemade-pumpkin-puree-recipe/), just know that it doesn’t work in ALL recipes, so you may need to do some experimenting if you go that route. I’ve got small cinnamon chips that I’d like to try and unfortunately I have to leave out the nuts – just can’t anything with nuts in it. I think that would be delicious with the cinnamon chips! Know I do not have a can of pumpkin that large but am trying to eat healthy and think I need to pass on this one. I’m definitely NOT a fan of pumpkin and chocolate together, however I’m going to give this a try with cinnamon chips and maybe even use your cinnamon roasted pecans instead of just plain pecans. I need a new go-to pumpkin bread. That sounds like a fantastic idea! Let me know how you like it! I have some pumpkin here waiting to be used, and am so happy to have found this recipe. Heading to the kitchen now to try it out.